Tube passengers are set to have their journeys disrupted for almost a year when Central Line trains cease stopping at one of London's busiest stations. From Saturday, Central Line trains will not stop at Tottenham Court Road. Transport for London (TfL) has advised people to change at Oxford Circus or Holborn for alternative routes. The work is intended to improve access to Central Line platforms, with new entrances and lift access from the ticket hall and to the Northern line. Northern Line trains will continue to stop at Tottenham Court Road. By 2016, TfL said the station will be fully accessible and the ticket hall will be five times larger than its current size. Currently around 150,000 people use Tottenham Court Road daily but TfL expects this to rise to more than 200,000 when Crossrail serves the station in 2018. The station will have eight escalators, five lifts, new Art on the Underground installations, improved CCTV cameras and better lighting. The refurbishment of Tottenham Court Road Tube station is part of London Underground's (LU) £10bn programme of modernisation. 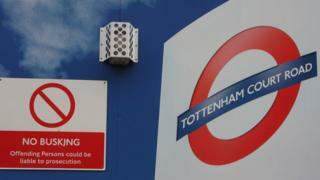 Central Line services are expected to return to Tottenham Court Road next December.